Every workgroup has a daily demand for fast, cost effective and, in many cases, confidential, hard copy communication. This is where this multi-functional machine really makes its mark. 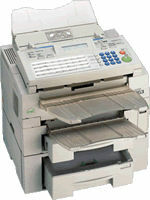 As a laser plain paper fax it has an impressively fast Super G3 transmission time that speeds faxes around the world, at an appreciably low cost. A range of other outstanding features, including special confidentiality functions, further enhance all-round fax performance. With our optional connectivity kit it can also bring you laser printing, PC faxing and scanning. Choose from the genuine and compatible toners and maintenance kits below.